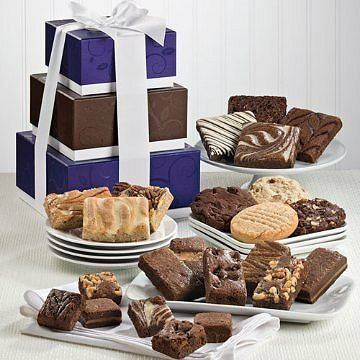 Surprise them with this splendid pillar of gourmet treats. With an ample supply of Fairytale Brownies in three sizes, chewy Fairytale Cookies and Buttery Fairytale Bars, they'll certainly remember your gracious gesture. This gift contains the following: 1 Raspberry Swirl Brownie, 1 White Chocolate Brownie, 1 Espresso Nib Brownie, 1 Cream Cheese Brownie, 1 Caramel Sprite, 1 Chocolate Chip Sprite, 1 Original Sprite, 1 peanut Butter Sprite, 1 Toffee Crunch Sprite, 1 Walnut Sprite, 1 Caramel Morsel, 1 Chocolate Chip Morsel, 1 Original Morsel, 1 Raspberry Swirl Morsel, 1 Walnut Morsel, 1 Cream Cheese Morsel, 1 Caramel Pecan Cookie 1 Peanut Butter Cookie, 1 Double Chocolate Cookie, 1 Coconut Walnut Cookie, 1 Pecan Blondie Bar 1 Raspberry White Chocolate Bar, and 1 Cheesecake Swirl Bar.